BARRON, Wisc. 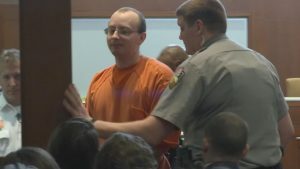 (KARE) – The man accused of kidnapping 13-year-old Jayme Closs and killing her parents has been ordered to stand trial after waiving his right to a preliminary hearing. The appearance marked Patterson’s first in-person public appearance since the Barron County District Attorney’s office charged him with two counts of first-degree intentional homicide, felony armed burglary and the kidnapping of Jayme Closs. Jake Patterson gave brief answers to the judge Wednesday. He acknowledged he was giving up his right to a hearing at which prosecutors would have had to show they had enough evidence to warrant a trial. The judge then set arraignment for March 27. A large group from Jayme’s family was also in the courtroom.